Less than a month earlier, inside an arena in Prague, clad in a crisp blazer and tie, Rod Laver had sat courtside to watch the likes of Roger Federer, Rafael Nadal, Nick Kyrgios and Sam Querrey play the Laver Cup. There had been drama and shot-making, the players sparked to life even more both by the presence of the remarkable Australian legend and the rarity of a team event. Now, 5,500 miles from Prague, the 79-year-old Laver was in New Braunfels, Texas at the John Newcombe Tennis Ranch for another tennis event. Here too, he would witness drama and shot-making, also in the setting of a rare team tennis-style competition. In this case, it was outdoors. By 10:30 a.m., the temperature was north of 80 degrees. Instead of a seat, Laver stood behind a fence. All of the players he watched were of the recreational variety. There were men over 60, NTRP 3.5-4.0 players who’d likely never played a match in front of more than ten of their peers. There were a few more experienced, a sprinkling of NTRP 4.5s in their 50s and 60s, some of whom had played college tennis. And also the occasional 5.0-5.5, youthful men in the 25-45 range. 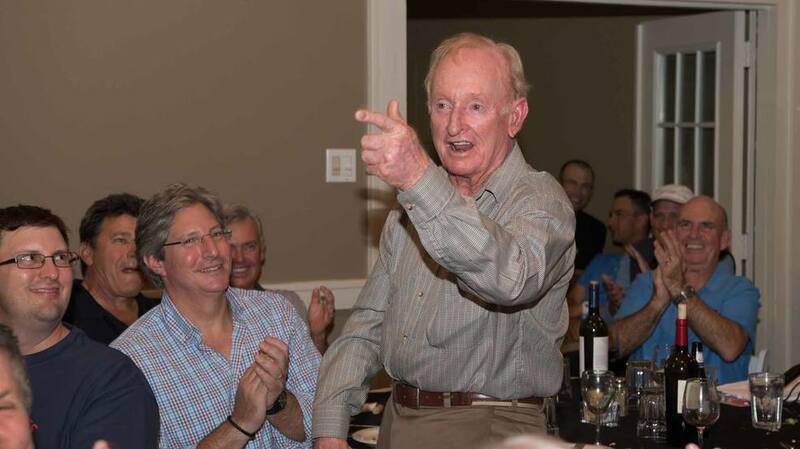 In this instance, Laver was a captain at Tennis Fantasies with John Newcombe and the Legends, an annual, weeklong fantasy camp that this year took place for the 30th time. Laver shared his captain duties with three ex-pros – a pair of Aussies mates, Owen Davidson and Ross Case, as well as Luke Jensen. The four of them that morning paced the ranch’s courts to watch their 28 players compete in a range of singles and doubles matches. In this case, the opposing team was a squad led by Laver’s lifelong mate, Roy Emerson, as well as ex-pros Marty Riessen, Danie Visser and Peter Tramacchi. Tennis Fantasies had happened 26 times. The event had become its own special community, strongly flavored by the values that had made Australians a tennis power – competition and camaraderie, not necessarily in that order. During that first-quarter century, one question persisted: Where’s Laver? And then, beginning in 2014, the Rocket had arrived. It was as if Dylan had at last come to a grand rock festival; the legend at Woodstock. And so, on this Wednesday morning, the second day of the event’s competitive phase, Laver’s fingers gripped a fence to watch two men in their 50s do something that Laver had done arguably better than anyone who’d ever walked the earth. Soon enough, the grand leader of Australian tennis, Harry Hopman, would recognize the lefty lad’s ball-striking skills. But he wasn’t impressed with Laver’s lackluster movement. As a kindly and motivational joke, Hopman nicknamed Laver, “Rocket.” Of course, as the world would later see, the Rocket would soar. The two campers Laver watched would finish their match with a tiebreaker. Laver took it in from behind the court. The player he had coached, a fellow Aussie, had been the loser. “Bad luck,” said Laver to his charge. To the winner: “Nice job closing it out.” Off now Laver went to see another match. By afternoon, he sat in a lawn chair behind Court 5 at the ranch. Four campers were engaged in doubles. Volleys flew left and right. “Hey, that’s pretty good,” said Laver. Then a double-fault. “Those can happen too,” he said. But Laver points out that those great shots he often hit – mind-boggling angles, scintillating spins – were not result of inspired genius, but of extensive work. Laver once estimated that every shot he ever hit in a match was one he’d practiced hundreds of times.